At long last, former UFC heavyweight champion Cain Velasquez is scheduled to return to the cage. The heavyweight legend is set to take on former title challenger Francis Ngannou at UFC Phoenix on February 17. If Velasquez is able to topple the fearsome Ngannou — not a certainty by any means — it’ll open the door to other huge fights in the ever dangerous UFC heavyweight division. Of all the fights that would become available to him, it’s arguable that none would be as big as a super fight with UFC light heavyweight champion Jon Jones. Fans have been clamoring for a Cain Velasquez vs. Jon Jones fight for years, and from the sounds of it, the former is up for the challenge. While Cain Velasquez says he’d happily welcome Jon Jones to the heavyweight division, Jones does not appear to be in any rush to move up a weight class. Speaking to BJPENN.com this week, Jones’s coach Mike Winkeljohn stated that the light heavyweight champ will probably focus on defending his light heavyweight title for the time being. 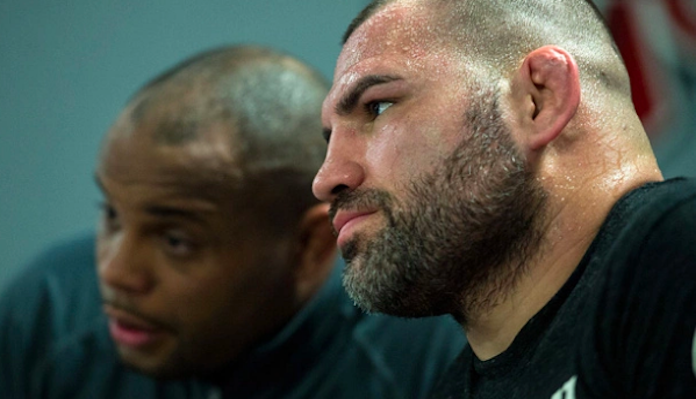 Would you like to see Cain Velasquez and Jon Jones fight in the future?